What kind of range should I expect from an electric boat motor? For a boat using an electric motor, consider the battery as your “fuel tank.” Therefore, the more battery power available the more “fuel” available. Range will ultimately depend heavily on the type of cruising you plan on doing and how many ‘battery banks’ you have available. Wind, water current and water conditions also affect your time on the water. A general range optimization strategy is to find the “sweet spot” where your speed and amp draw will get you the most range. 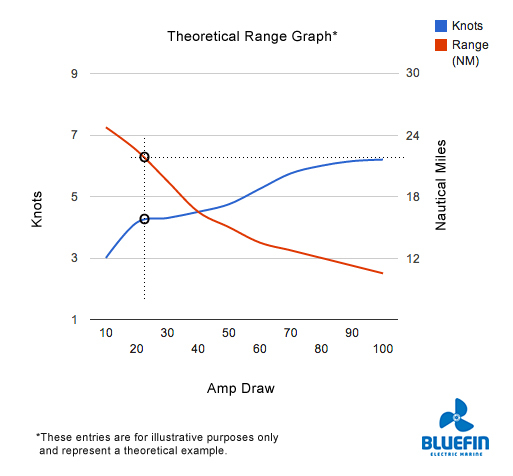 Generally this means drawing back on your knot speed to approximately 50-60% of your hull speed and using around 20-30% of your available amp draw. Below is a theoretical range graph one might expect to see powering with an electric sailboat in smooth conditions. **This graph is for illustrative purposes only and represents a theoretical example. Water conditions and individual boat dynamics will compute different findings. What kind of battery is best for my electric boat motor? AGM or Lithium? At this point due to cost we recommend using AGM (Absorbed Glass Mat ) batteries over lithium. These batteries create voltage using the time tested lead acid technology however they use much less battery acid than a traditional lead acid battery. What factors decide which system voltage will be best for an electric boat motor? Currently we offer 48V and 72V systems. Ultimately we look at this in terms of wattage, the higher the wattage demand the higher the voltage required. If you want more power for your electric boat, you will require a more powerful electric motor. What kind of power characteristics can I expect from an electric boat motor? 2000 rpm to make enough torque to drive the boat forward. at full current. This gives you very high torque available for acceleration. How do I regulate RPMs on an electric boat motor? pulses. The longer the pulse sent to the motor, the more power and RPM the motor outputs. This instant use of available power makes the system extremely efficient. Why is there reduction gearing on an electric boat motor? There are 3 great reasons for using gear reduction. It’s easier on the motor to spin the prop which means there is less current draw from your batteries. If by unfortunate chance you hit your prop, the pulley and belt will absorb the impact vibration from the propshaft. If the propshaft is directly linked to your electric motor the chance of damage is significantly more should an impact occur. Gear reduction produces Torque. The torque produced by the output is inversely proportional to the amount of gear reduction. Say what? In short, if you have a 2:1 gear ratio then the prop speed turns 1/2 as fast but has twice the torque! It’s physics. What kind of maintenance should I expect to perform on an electric boat motor? On the motor itself, the cost of maintenance is very low since it is only needed for two parts. The brushes have a lifetime of 4000 hours. The gear belt has a life time of 3000 hours. How difficult is it to install an electric boat motor? *Any work required for your boat should be performed by a trained professional to ensure your boat meets local safety and insurance standards. ** Shaft angles and available space may vary. Anything such as a V-drive will probably require modifications done by a professional. ***WARNING: working with electricity is hazardous and should only performed by a trained professional. Note: Most electric propulsion packages require a trained marine electrician to perform the install so that the warranty can be validated if any issues arise.